In his first philosophy, later called the Metaphysics, (or “after the Physics”), Aristotle discusses the meaning of being as being. He refers to the unmoved movers, and assigns one to each movement in the heavens and tasks future astronomers with correlating the estimated 47 to 55 motions of the Eudoxan planetary model with the most current and accurate observations. According to Aristotle, each unmoved mover continuously contemplates its own contemplation; The planets and stars, which have their source of motion within themselves (by virtue of aether, Aristotle's fifth element) aspire to emulate the uniform circular motion of their particular mover. Thus captivated, their tireless performance is entirely the result of their own desire. This is one way in which the movers are said to be unmoved. 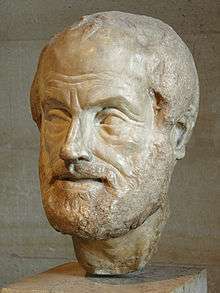 Likewise, they must have no sensory perception whatsoever on account of Aristotle's theory of cognition: were any form of sense perception to intrude upon their thoughts, in that instant they would cease to be themselves, because actual self-reflection is their singular essence, their whole being. Like the heavenly bodies in their unadorned pursuit, so the wise look, with affection, toward the star; and hence as a role model, they inspire those who look up to them, and by whom others still, will yet find themselves enthralled, and so on, creating the enduring natural order of aeon, season, animal and plant. ↑ Leo Elders, Aristotle's theology: A commentary on Book [lambda] of the Metaphysics, Assen: Van Gorcum, 1972; Michael Frede, David Charles, ed., Aristotle's Metaphysics Lambda, Oxford: Oxford University Press, 2000. ↑ Oberman, Heiko. Luther: Man Between God and the Devil, 1982, trans. Eileen Walliser-Schwarzbart, 1989. p. 160. ↑ Especially since the 1990s, there have been scholars who argue that the early Reformers have been misunderstood in their stance against Aristotle (and the Scholasticism that he permeated). A distinction must be made between scholastic methodology and its theological content. See the self-avowedly ground-breaking collection, Protestant Scholasticism, eds. Trueman, Carl, and R. Scott Clark, 1997, page xix. Even within that volume, however, Luther is admitted to have made a complete, sincere, and absolute renunciation of scholasticism (see D.V.N.Bagchi within Trueman and Clark, page 11). ↑ Luther is certainly more acerbic and quotable, but both Calvin who "denounced scholastic theology as contemptible" (Payton, James R., Jr, Getting the Reformation Wrong, 2010, page 197) and Melanchthon who found that the church had "embraced Aristotle instead of Christ" (see Melanchthon, Loci Communes, 1521 edition, 23) also rejected Aristotelian elements of scholasticism. ↑ Luther's quotes aimed directly against Aristotle are many and sometimes strident. For example, "Virtually the entire Ethics of Aristotle is the worst enemy of grace" (Thesis 41) and "Briefly, the whole of Aristotle is to theology as shadow is to light" (Thesis 50) in Luther's 97 Theses of September 1517 (Luther, Disputation Against Scholastic Theology, 1517). ↑ In a personal note, Luther wrote, "Should Aristotle not have been a man of flesh and blood, I would not hesitate to assert that he was the Devil himself." (Luther, 8 Feb 1517; quoted in Oberman, 121). ↑ "Thomas [Aquinas] wrote a great deal of heresy, and is responsible for the reign of Aristotle, the destroyer of godly doctrine." (Luther, Against Latomus, 1521; quoted in Payton, 196).